Protesters affiliated with Occupy Wall Street moved uptown on Tuesday to demonstrate outside of some of New York's richest residents' homes. 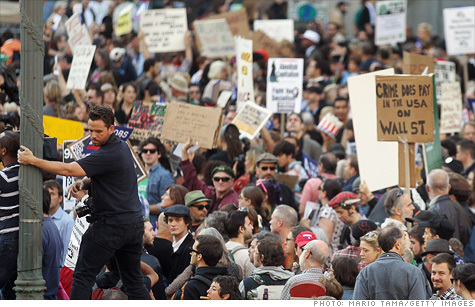 NEW YORK (CNNMoney) -- Occupy Wall Street is on the move ... uptown. Why uptown? Because that's where the rich folks live! Community groups and progressive organizations that have been working with the broader Occupy Wall Street movement in New York marched Tuesday to the homes of JP Morgan Chase (JPM, Fortune 500) CEO Jamie Dimon, billionaire David Koch, hedge fund honcho John Paulson, Howard Milstein, and News Corp (NWSA, Fortune 500) CEO Rupert Murdoch. The millionaires and billionaires were targeted for what event organizers called a "willingness to hoard wealth at the expense of the 99%." Making their way up 5th Avenue, the protesters -- relatively modest in number -- chanted "We are the 99%" and "Banks got bailed out, we got sold out." Until Tuesday, protesters had not strayed too far from lower Manhattan, where a home base of sorts has been established at Zuccotti Park. The march was organized by UnitedNY, the Strong Economy for All Coalition, the Working Families Party and New York Communities for Change. Protesters converged on 59th Street near Central Park, where they started their tour just after noon. Doug Forand, a spokesman for the groups, said that the protesters did not have a permit for the march, but were not planning on obstructing traffic and would stick to the sidewalks. Organizers declined to estimate how many protesters would attend. A Facebook event page dedicated to the march had a modest number of confirmed attendees. On Monday, New York City Mayor Michael Bloomberg -- also a billionaire -- said that Occupy Wall Street protesters could stay in Zuccotti Park indefinitely, so long as they obeyed the rules. "The bottom line is people want to express themselves, and as long as they obey the laws, we'll allow them to," Bloomberg said.